Aston Villa’s 1-0 defeat to Wolves on the weekend heaped more pressure on Gerard Houllier, who now appears to have alienated fans along with his players following a string of disappointing results. The Holte end made its feelings clear during the game, and despite backing from the board one feels Houllier is very close to leaving Villa Park. Would there be much sense in sacking Houllier at this stage of the season, with 8 games left? The club are in an extraordinarily precarious position; in fourteenth place but only one point above the relegation zone. I wondered if there was a precedent for sacking managers in similar positions, and looked at all relegation-related managerial departures from the past 8 seasons. This of course is not an exact science – what is a relegation-related departure? I’ve tried to be as vague as possible, looking at any sacking, resignation or departure by mutual consent for managers with clubs at risk of relegation. I’ve ignored, however, managers leaving clubs in a transfer-like situation, such as Owen Coyle to Bolton from Burnley, since they were not forced out in some way against their will, and in all probability wanted to leave the club more than their clubs wanted rid of them. Managers left relegation-threatened clubs at an average of 17th place in the league. By the end of the season, these clubs averaged 16th in the league. 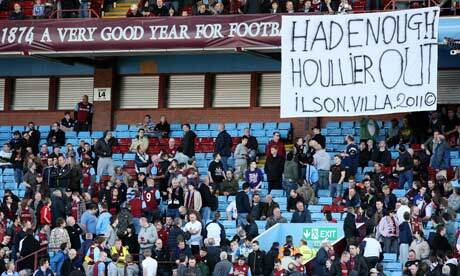 So if Houllier was sacked, Villa would probably stay up, right? Especially when only two clubs around them have changed managers this season (West Brom/Hodgson and Blackburn/Kean) in an eight-way relegation scrap? Indeed, sacking relegation-threatened managers in the second half of the season has been a rarity, with only a further three managers sacked with less than 19 games left, with one of those occasions being a surely-doomed Mick McCarthy at Sunderland. On average, managers have left their relegation-threatened club with 22 games left in the season. Going back to the four managers sacked with 8 games or less left in the league, three of these managers were 15th and saw their former clubs avoid relegation, whilst Phil Brown left an eventually-relegated Hull in 19th place. Whilst 75% is a decent success rate, there certainly haven’t been enough cases to definitively say that sacking a manager so late in the season has been a success. Fulham and Leeds in 2002/03 were saved with 2 weeks left in the season, whilst Fulham only avoided relegation by a point in 2006/07. These clubs also enjoyed much larger point cushions from the relegation zone than Villa do now, despite their precarious league positions; Leeds (7 points clear), Fulham 2003 (6) and Fulham 2007 (4) could perhaps afford one or two bad results. All this means that sacking Houllier would be an unparalleled move in recent Premier League years. The club are an impossible situation, and perhaps this is why so many chairmen in the past have decided not to change status quo at this stage of the season, unless forced. Randy Lerner’s situation is made all the more difficult by club expectations, and I don’t think many envy him at this moment in time. Note: I received a question on why Alan Shearer’s appointment at Newcastle with 8 games left in 2008/09 was left out. I’ve excluded this managerial change since it was enforced upon Newcastle; Joe Kinnear stepped aside on health grounds. Similar cases have also been ignored in this analysis. …which I thought would be a lot higher. I guess that depends on how far it was into the season (e.g Redknapp coming to Spurs with 30 games to play, Hughton getting sacked from Newcastle before Christmas, compared to if Villa were to sack Houllier today are totally different positions, clearly). Villa are a strange case. I was never much of a fan of O’Neill, and although Houllier has an impressive track record, his time out of management made this a very questionable appointment. For a club of Villa’s ‘size’ (whatever that may be, sleeping giants etc etc) you would have thought a higher profile appointment was likely, but I guess he must have said something impressive in his interview or something. Villa fans seem to have been rather disappointed by the appointment from the start, which is fair enough. They no doubt have a top 10 squad, it just seems so strange at Villa at the moment, like there is no chemistry between the squad and the manager, and obviously looking at that picture above with the manager and the fans. It has to be difficult to lift yourself as a player when the fans are concentrating partly on wanting the manager out. They’ll always be looking for little things to blame him for as well, so they will spend more time moaning then supporting you as a player. This seems to be very much a swan-song for Houllier, who would have frustrated me immensely if I was a Villa fan by now, not just with questionable tactics, substitution, selection and transfer activity (Steven Ireland hardly had a kick either…) but with what he says in the media. It’s almost as if he’s walked into this job thinking he’s got nothing to lose and is still living off success in France and of course at Liverpool. I honestly think they are one of 6 relegation candidates this season, with Wigan, Wolves, West Brom, West Ham & Blackburn being the others. The Houllier gamble has not paid off, and it’s getting worse. Villa have some massive games coming up, in their last 8 games they travel to West Brom, West Ham, Arsenal and Everton; all teams on the up at the moment it seems, and face Newcastle, Stoke & Wigan at home, all scrapping as well at this stage (Stoke less so now, to be fair, but never easy to play against) with Liverpool going to Villa Park on the last day. It would be a big loss to the league to lose a club like Villa, but relegation can happen to anyone.